Wouldn’t it be nice if you could just restart your computer and all the changes made were simply wiped out? 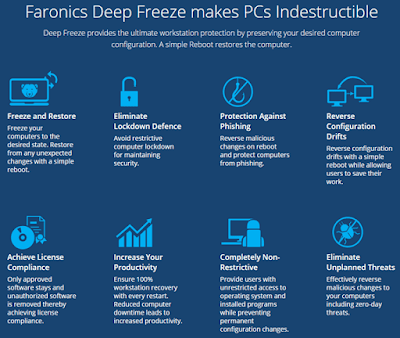 Luckily, there is a way to do this using a program called Deep Freeze by Faronics. Now you would be right if you looked at that page and thought that this is a program that is used by big companies or institutions. However, those are not their only customers. They sell a standard edition of the program for $45, which in my opinion, is cheap considering the benefits. I’ve spent a lot more on software and have normally been disappointed. That’s why nowadays I only use freeware or purchase subscription software like Office 365 and Adobe Creative Cloud. However, this is one program I can recommend purchasing because there simply isn’t a freeware that can do the same thing in such a convenient way. It’s worth noting that I have not been asked to write this review by Faronics or anything like that. I found out about the program because the community college where I am taking classes uses it and it works exceptionally well. I decided to try it out on my test PC that I use for installing software when I write reviews and it’s made life a lot easier. Since I’m talking up the program so much, let’s go over what it does. Basically, it makes it so that anything you do to your computer can be fixed by just rebooting the machine. Want to delete the entire System32 folder? Go for it. Randomly delete keys from your registry? Not a problem. Install malware and viruses on your system? It’ll be gone after a reboot! The last point there about viruses brings up one limitation of the Deep Freeze program. Basically, it acts like a reset for your computer hard drive. When it reboots, it gets reloaded to the last frozen state. Whatever happens in that time between reboots is a free for all. This means a virus or worm installed will definitely be removed on reboot, but it could cause damage to other systems until the next reboot happens. In corporate environments or in institutions, the user accounts are also restricted and the computers are normally forced to restart at least once a day. For home use, I’m the one using it, so I don’t really need that much control. If I’m working with something I know is dangerous, I’ll make sure to restart my computer immediately after. What I like about the program is that you don’t have to spend any time trying to lock down your computer and you don’t have to spend any extra time recovering your computer. I’ve previously written articles on using system restore, backing up and restoring your registry, restoring your PC to factory settings, and even clean installing Windows 10, but they all require a lot of work plus more work reinstalling your programs, etc., etc. Deep Freeze also has another state called Thawed. You can reboot the system into thawed mode, whereby you can install more programs, update settings, drivers, etc., and then refreeze the computer in the new state. It’s kind of like using a virtual machine, but not exactly the same thing. Virtual machines are great and I use them a lot, but setting them up can take time and requires a decent amount of technical knowledge. Using Deep Freeze requires pretty much no technical knowledge. What the program does is very technical, but the interface is bare-bones and very easy to use. I should also mention that the support is excellent. Since they have a lot of huge corporate clients, they have local staff available that speak great English. I had one issue after installation, which I’ll mention below, so I called and had a representative in less than 2 minutes. Once you purchase the program and download the ZIP file, extract it and run the application. You should see the main install dialog. Click Next and then accept the license agreement. After that, you’ll need to enter your license key that should be on the final purchase page and emailed to you. On the following screen, you’ll pick which drive to configure for deep freezing. I have multiple hard drives in my computer, but I chose to just stick with the C drive since that holds the operating system. You can use it for data drives also if you like. Next, you have to configure the ThawSpace size. This is a virtual partition that can be used to store data you want to retain even if the system is frozen. I personally recommend unchecking the Create ThawSpace box because it just makes things more confusing. If you want to retain anything like a file, it’s best to save that data to a drive or partition that is not frozen. If you only have one drive with one partition, you should cancel the install and partition your hard drive. If you have a tiny drive and not enough space to partition, then you can create the ThawSpace, which will show up as another drive when you are using Windows. The program will now be installed and the computer will reboot. You should see the Deep Freeze icon in the taskbar notification area. Now this is the place where I had to call customer support. When I right-clicked or double-clicked on the icon, nothing happened. I couldn’t figure it out and the rep told me it’s a security feature. You must either hold down the SHIFT key and then double-click or hold down CTRL + ALT + SHIFT and then press the F6 key. You’ll see the password dialog pop up, but you can just click OK since there is no password set after a fresh install. On the main screen, you’ll need to click the Activate Now button to activate the product. You’ll also want to click on the Password tab and type in a new password so that only you can access the settings. On the Boot Control page, there are basically just three options, which makes using the program very easy: Boot Frozen, Boot Thawed on next x restarts and Boot Thawed. Booting thawed means you’ll be able to make changes to the system and they will be saved rather than removed. I suggest choosing Boot Thawed, then restarting your computer and then installing any Windows updates, software software, etc. Many times Windows doesn’t complete an update in one boot, so you have to reboot several times. Once you have completed all the updates, set it back to Boot Frozen and then restart. Overall, it works very well and that’s probably because it’s been around for a long time. I would not recommend using this on your main machine until you test it out on a secondary system. I use it for my test computer, but don’t use it on my main PC since I’m the only one using it and I have a lot of security in place already. Also, it does have a performance impact, though it is very minimal. If you have a computer with low specs, I would avoid using Deep Freeze. You don’t need a super fast computer, but it shouldn’t be anything more than 3 to 5 years old. 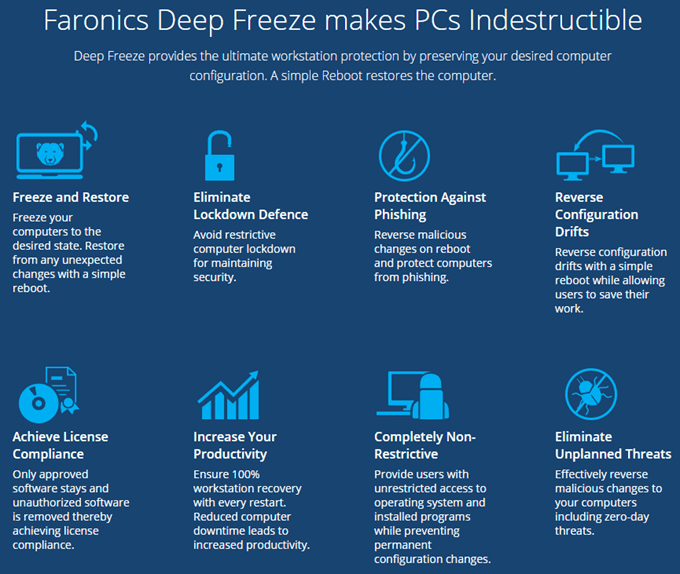 With the low price, great customer support and simple setup, Deep Freeze is definitely a program more people could benefit from. Enjoy!